Cass Tech alums Keenan Smith (left) and Clarence Johnson delivered over 800 bottles of water to their alma mater. Due to elevated levels of lead and/or copper in drinking sources in 16 Detroit Public School Community District (DPSCD) schools, Superintendent Dr. Nikolai Vitti shut off every drinking fountain districtwide. The district allocated $200,000 to supply all 106 DPSCD schools with cooled water coolers until a long-term solution is provided, but that money and supply of water is bound to run out within months. In an effort to assist DPSCD with supplying enough water to every school in the district, a number of DPSCD alums have started water drives for their respective schools, to help cushion the district’s budget and provide community assistance. 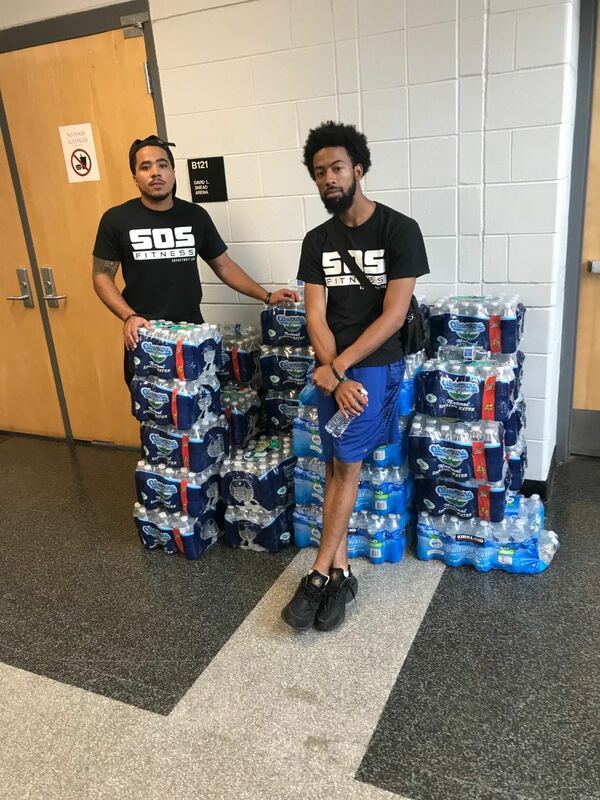 Shannon Smith graduated from Martin Luther King High School in 2008 and donated over 150 bottles of water to his alma mater and 10 cases to John R. King Academic and Performing Arts Academy on Detroit’s west side. Smith just so happens to be running for Board of Education in Detroit but wanted to make it clear that his efforts were not politically driven, but about humanity, dignity, and ensuring that the entire community is advocating for children not yet able to speak up for themselves. M.L. King alumnus Shannon Smith delivered over 100 bottles of water to his alma mater and John R. King Elementary. Cass Tech High School was built in 2005 and is a state-of-the-art, six-story edifice that cost well over $100 million to build. Yet, it was on the list of schools that tested positive for elevated levels of copper and/or lead, possibly due to old infrastructure. Clarence Johnson played football for the Technicians in 2012 and along with several of his classmates, Chante Adams (2012), and Keenan Smith (2011), donated 875 bottles of water to the school. Since student-athletes cannot drink water from the school’s source, they have to use water jugs to repeatedly refill water bottles during practice and games for football, volleyball, and cross country. Cass Tech football has over 70 student-athletes on its varsity football team and needed the extra help, since the school itself has close to 2,500 students. “There is this culture at Cass Tech where we reach back to current students,” said Johnson. “I connected with my old football coach, Thomas Wilcher, and he helped us coordinate it. It’s important work and I encourage others to do the same. Personal trainer and boxer Clarence Duvose delivered cases of water to DPSCD schools on Monday. Johnson’s old classmate at Bates Academy in Detroit, Justin Gordon, saw what he was doing and decided to join in on the action. Gordon, who attended Renaissance High, had some water in his car and dropped it off at Mumford High. The following day, he took $20 of his own money and donated 100 more bottles of water to CMA High School. Gordon is a graduate of the University of Michigan and ran a program over the summer at Mumford where he helped 9thand 10th-graders create a short film called “RIVAL$.” They made RIVAL$ t-shirts to commemorate the experience, which Gordon is selling to support his initiative to provide DPSCD students with clean water. Dozens of other DPSCD water campaigns have sprouted all over the city. Jamilah Jackson is a journalist for the City of Detroit and gathered a few other Renaissance alums to deliver water to their alma mater. Clarence “Clay” Duvose is a popular trainer and boxer who owns a gym in Ferndale. He attended McGregor Elementary and Heilmann Middle School in Detroit and is using his “Clay Hova Cares” organization to collect water. Costs to fix the infrastructure in DPSCD were estimated to be as high as $500 million, which the district does not have. The drinking water shutoffs in the schools could last for months, so, many of those collecting and donating water plan to do so until a permanent solution is figured out.